I only stayed for one night, so my experience of the facilities was limited. It is a peaceful farm campsite a long way from anywhere. There were two camping fields, but during my stay, the second field was being closed off as I think they were about to bring some cattle or sheep down closer to the farm. The one field that was available was fairly small and had a lovely little stream running through it, but the remaining pitches were soggy underfoot and my tent felt as if I were sleeping on a water-bed. I’ve been camping for many decades, but this is the first time that I’ve ever had massive slugs coming in to try to get at my food supplies! But it was OK. If staying in this particular area is important to you, I would recommend checking the state of the pitches before arrival. For £10 per night for one person, it was a little dearer than I expected, but I believe the rates become more reasonable if there are more people in a unit and at least the showers were free to use. There was one wash block in the field and another attached to the farmhouse, just across the spotlessly clean yard. There was also a fridge available in this second block, along with a fully-equipped washing-up sink, which is quite unusual. I arrived and pitched alone, with help from the very friendly other campers. I always felt safe and relaxed as a lone female camper. The facilities are fine - showers & toilets sufficient and well maintained. 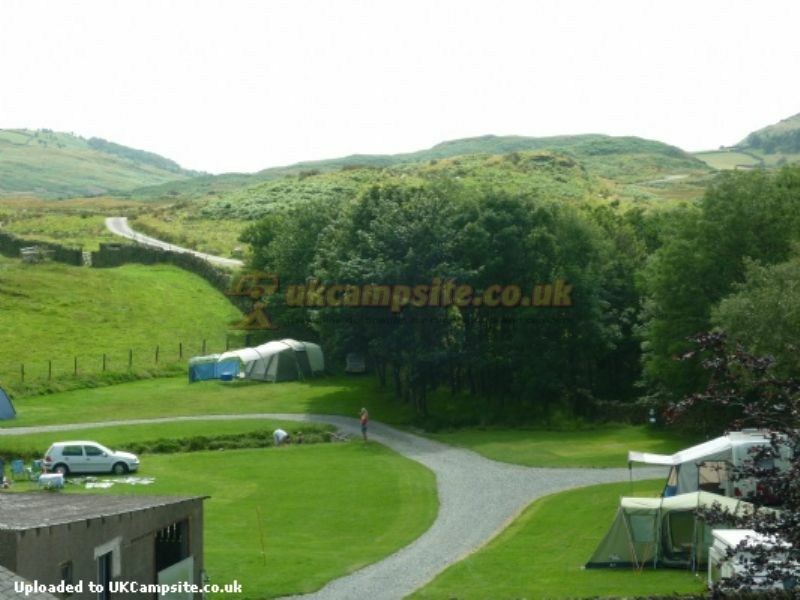 There is also a fridge and washing machine/drier for campers use. There are hook ups, but these were all taken by the time I booked. It was lovely to see children playing in and around the small stream which is in clear sight of all the pitches in the main field. Ulverston (20-30 min drive away) has all the facilities you would need (including several Pokemon lures and gyms for one of our party!) It is a lovely town to potter in and I can recommend the Fish & Chips from the town center cafe. 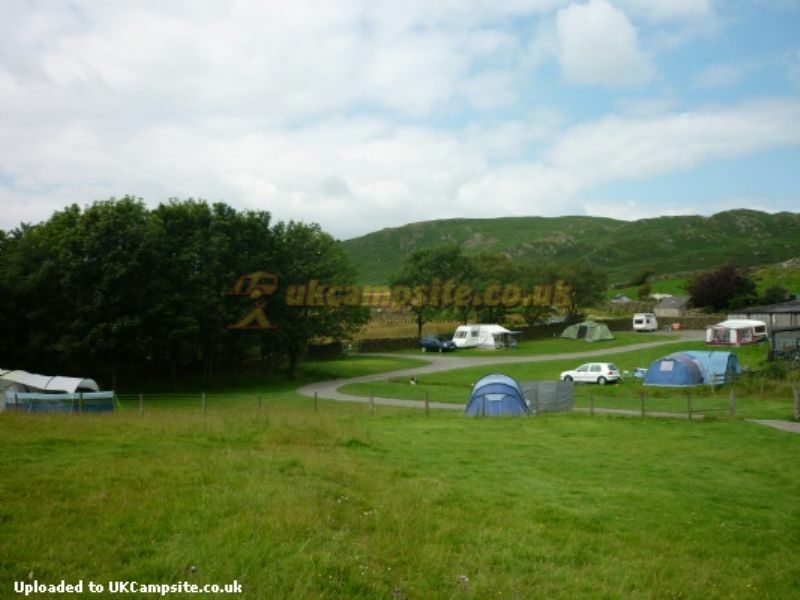 The site is also within an easy drive for the South Lakes, Fells and coastline. There are local walks from the site with maps available from the washing up room. I loved it so much I'm planning to rebook, as are the friends who joined me for the last 3 days. Excellent little site well off the beaten track (down a narrow winding road) surrounded by beautiful countryside. Stream running through the campsite a great draw for children (of all ages) and dogs alike. Basic facilities but clean and well cared for. Very friendly. Directions spot-on. This is a great site. 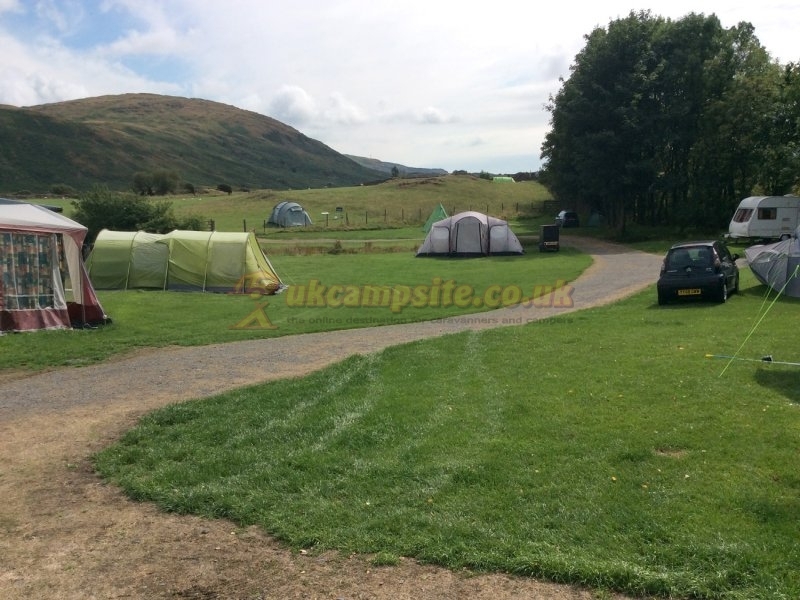 It is small enough to be close to the fells and paths and big enough to have space to enjoy a stay. Facilities are very good and there's a fridge, new washing machine and tumbler. Linda is really helpful but not intrusive. It is a working farm and busy but we enjoyed this aspect of our six day stay. Thoroughly enjoyed our stay at this camp. Facilities were basic and shared but were adequate and clean. A fridge with freezer section and a washing machine was available. A stream does run through the camp, which needs to be considered if you have small children. At £12 per night for a family of 4 it was very good value for money. Stayed for a few nights in August. Nice site away from hustle and bustle. Lovely views and nice to wake each morning to the sound of the cockerel and farm animals. Toilet block is basic, no hand drying facilities and no soap on many occasions but never ran out of loo roll and never had to queue. (Shower head in large cubicle needs descaling or replacing) There is no heating in the loos/showers so can be chilly but this didn't bother us at all. All in all, a great place to stay. Would we come again?? DEFINITELY! Used this site as a first stop on the Cumbria way walking trail. Basic farm site so not a lot in the area, within walking distance at least. No pubs or nightclubs, if you are after an all singing all dancing plastic interpretation clubhouse included of what camping is about, I suggest this is not for you. But this is a fantastic site; facilities first class and a very warm welcome. Highly recommended. If you're looking for lots of activities, a bar, disco, and good TV reception this may not be the place for you. If you like peace & tranquillity in a remote rural setting with simple, clean facilities and friendly helpful owner, this is perfect! Care is needed driving to the site along a narrow twisting, hilly road, especially with a larger vehicle. Toilets / showers clean and well maintained. Waste / recycling bins clearly marked. The site is small enough for water taps to never be far away but there's plenty of space for each (numbered) pitch. Level pitches with reasonably short grass are easily accessed from the track. The small beck adds it's own charm. This IS a working farm, but there were no early or late noises, just the occasional tractor and the sheep bleating nearby after being rounded up. Extremely quiet at night! Looking forward to many more visits. Just back from 5 nights at birchbank. Smooth and simple booking in process and acknowledged with receipt for deposit. Instructions given are accurate to get you to site and very scenic. Met on arrival and given choice of available pitches, also given a tour of facilities. Had a good feeling on arrival as the setting is superb, the view stunning and the animals to keep you amused. Toilets and showers immaculate and well maintained. Plenty of non ehu pitches on other side of beck. 5 minutes drive to get back on main roads and explore all this area has to offer - cannot knock this place at all and will return. Just stayed for the bank holiday weekend, we were lucky with the weather as there was supposed to heavy rain all weekend. That must have been why there were only a few other caravans and people with tents. The location is stunning and a great place for walking. There is a utility type cupboard with a washing machine and tumble dryer both of which are just £2 each and also a small fridge with ice box that can be used free of charge. 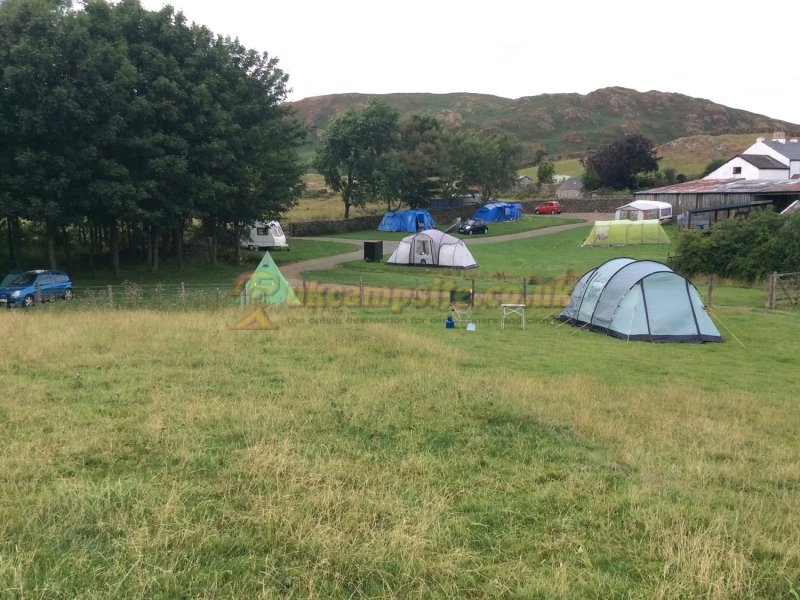 The showers and toilets are kept immaculate and the owner mrs Nicholson was very friendly. Great place to stay and would have no hesitation coming back again.